A basic GroupWise system consists of a single domain with one post office, a document library, and one or more users, as shown below. Each GroupWise user has a mailbox in the post office; users run the GroupWise client (Windows, Cross-Platform, or WebAccess) to access their mailboxes and to send and receive mail. 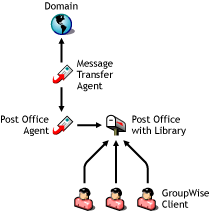 The GroupWise Post Office Agent (POA) delivers messages between users’ mailboxes in a post office, and the GroupWise Message Transfer Agent (MTA) routes messages between post offices (if there is more than one post office in the domain) and between domains (if there is more than one domain in the system). After you finish setting up your basic GroupWise system, you can review Section 3.4, What’s Next to learn how you can expand your system.